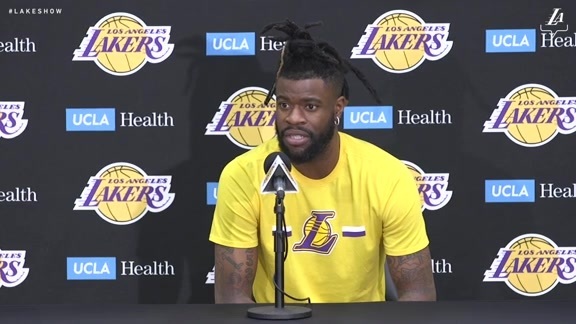 EL SEGUNDO – The Los Angeles Lakers have acquired Reggie Bullock from Detroit in exchange for Svi Mykhailiuk and a future second round draft pick, it was announced today. Bullock, a career 40 percent three-point shooter, has appeared in 44 games (all starts) for the Pistons this season, averaging 12.1 points (.413 FG%, .388 3FG%), 2.8 rebounds and 2.5 assists in 30.8 minutes per game. The 6-foot-7 guard/forward finished second in the NBA in three-point percentage last season (.445) and owns career averages of 6.6 points (.437 FG%, .396 3FG%), 2.0 rebounds and 1.1 assists in 253 games (103 starts) for the Clippers, Suns and Pistons. Mykhailiuk played in 39 games for the Lakers this season, notching 3.3 points per game (.333 FG%, .318 3FG%).